There are lots of systems, products and tools available to help sales operations with the process of providing quotations and tracking prices for products. Probably no two of these offerings are exactly alike, which is a good thing since the specific needs of individual organisations are likely to be unique as well. 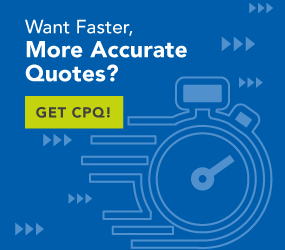 The more complex a product is, the more variable the solution will be in terms of conditions addressed and pain points mitigated, and the more robust the CPQ solution will need to be. Simple products may still need quote and proposal automation due to price volatility or supply-chain disruptions. For quoting software products, the main concern is getting the price right in terms of market dynamics. The key element in these situations is not the product itself but the price. It’s a simple matter of how much this product costs right now. Complex products are driven by different priorities. The makeup of the product offered must align with the customer’s specific needs. To meet a wide array of needs, products must be flexible. Optional parts, models and feature sets customise a basic product to enable it to address the needs and requirements of a specific buyer. This means pricing and quoting software has to do a lot more than pull up a single line price based upon market conditions at the time of the sales discussion. The best quoting software for complex products needs to be directly involved in the configuration of the product and how it addresses the customer’s needs and requirements. The basic functionality needed is somewhat obvious from the product description: configure price quote software. We need to look beyond this product description to see what these three functionalities really mean to complex manufacturers. Complex products are frequently built or assembled using other complex products as building blocks in their design. Those building-block products are composed of assemblies, sub-assemblies and individual parts. Quoting and estimating software must be capable of identifying each of these as individual parts, sub-assemblies, assemblies or fully configured products. Modifying the delivered product by swapping out any of these elements will change the final configuration and the capabilities of the delivered product. Selecting optional major components, assemblies or even the individual parts ultimately configures the final product to serve the customer’s specific and unique needs. The more complex the product being sold, the more robust the configuration capability of the system must be. Complexity is found within the market served as well as with the product sold. Global companies must be able to accurately price their products in multiple currencies using the correct country price list whilst considering the specific customer involved. National or global selling agreements between vendors and high-volume customers typically result in special pricing. Government accounts typically expect large discounts as well. Add to this the elements of promotional pricing tied to a specific span of time, and the result is many conditions and variables that affect the final price of the product. Sellers moving their products through multiple channels must address all of these variables that may indeed exist in unique combinations through each channel. This means there is no single price for anything. There may be 10, 50 or hundreds of prices that are valid under certain conditions in certain markets for any given product. Effective pricing and quoting software must be able to maintain all of those pricing variables administratively and also provide the right number for the specific customer and market served to the quoting sales rep. This is the challenge and requirement for the enterprise. At some point in every buying cycle, the subject of “how much” must be addressed. In some cases, it might be a ballpark quote, while others might be a written quotation. Sometimes, it may even require a formal presentation or proposal that summarises all of the research, discussions and findings associated with the buy cycle. Complex products frequently end up in the formal presentation selling format because they tend to be costly, involve a lot of different folks on the buying team and may be strategic in nature in terms of the buyer successfully executing their operational strategy. Quotation management software needs to do more than produce an accurate price for the sales rep and the buyer. At minimum, a generated quotation should be recorded, time-stamped and saved for future reference. Automating the proposal creation process is highly desirable both in terms of ensuring the correct content is included in the proposal and also from the economic standpoint of freeing the sales rep from having to cobble together a proposal instead of spending time actually selling. Finally, other critical elements for these automated quoting and pricing systems are mobility and platform. Sales reps are typically on the road with the customer, and all of the expert knowledge is left back at the office. Mobilising these solutions is critical so it is available to the salesperson at the point of sale, regardless of the salesperson’s physical location. Additionally, a company’s particular needs for an on-premise or cloud-based solution should be addressed as well. These are the basic, must-have features required for pricing and quoting software in the complex manufacturing space. There are many additional features and functions offered to fully realise the potential of this powerful technology.